Powers of Attorney is a document allowing someone else (an attorney) to look after your financial affairs if you become incapable of doing so yourself. 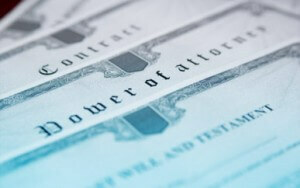 The law governing Power of Attorney was rewritten in 2007 and it is now possible to make a similar document authorising your attorney to make decisions about your health, welfare and medical care. These documents are called Lasting Powers of Attorney, because if properly prepared and registered with the Court of Protection, they will continue in force and can still be used even if you lose mental capacity or unable to manage your affairs due to illness after making one. However, they must meet certain strict legal requirements if they are to be valid, and, again, we recommend that if you are considering making Lasting Powers of Attorney, you engage a solicitor specialising in this area of work. After the registration of a Lasting Powers of Attorney, we are able to provide substantial expertise in asset management and have available to us a group of leading IFA planners. stockbrokers, accountants and surveyors, whom we are able to recommend to assist in this process. For many ageing clients, concerns over resource management and protecting their assets are a great worry, but we have long experience in avoiding pitfalls and ensuring that the client’s assets are fully utilised to make the aged or ill client more comfortable and free of anxiety.